High concentrations of soot, or black carbon, fill the skies over South Asia. In the past, scientists have thought that most of the soot comes from burning fossil fuels for transportation and industrial use. A new study, however, says that residential cooking  with stoves that burn wood, crop waste and dried animal manure  is actually the largest source of soot emissions in India. Understanding this pollution source could have an important role in bettering both air quality and climate models. 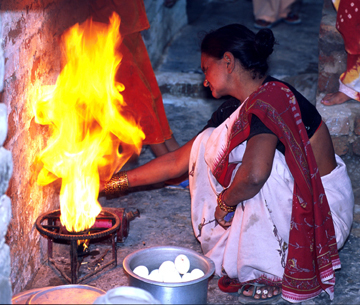 A woman in a food market in Delhi, India, cooks on a gas stove. A recent study says that cooking with gas-burning stoves, rather than with stoves that use wood, crop waste or cow dung, could reduce soot emissions into the atmosphere. Photo courtesy of WHO/P. Virot. Until now, so-called biofuels, such as wood, straw and cow dung, that are usually used by households (as opposed to industry) were not believed to be making a significant contribution to global carbon emissions. Thus, past scientific consensus reports from the Intergovernmental Panel on Climate Change lumped together estimates of soot produced by residential biofuels with other burning organic matter, such as forest fires. Now Chandra Venkataraman of the Indian Institute of Technology Bombay, along with colleagues from the University of California, Los Angeles, report in the March 4 Science that biofuel combustion is the largest source of black carbon emissions in India and that it should be addressed as a distinct source. They found that biofuels account for 42 percent of black carbon emissions over India each year, while the burning of fossil fuels produces 25 percent and forest fires produce 33 percent. The researchers reached their conclusions by burning various biofuels  four species of wood, six types of crop waste and dried cattle manure  in a common type of one-pot stove that accounts for more than 80 percent of Indian stove use. Simulating various local cooking practices, they boiled water, at both slow and fast burn rates, and kept it simmering for 5 minutes. They also tested two types of fossil-fuel stoves: liquefied petroleum gas and kerosene. Combustion occurred inside a hood that collected the emitted particles on filters, and thermal and optical measurement techniques monitored the smoke. Determining the amount of aerosol particles emitted per kilogram of burnt fuel, and taking into account known biofuel consumption, allowed researchers to calculate the relative percentages of each source. The paper is bringing a new source type to the whole community that works in this area, says M. Shekar Reddy of the University Corporation for Atmospheric Research, based at the Geophysical Fluid Dynamics Laboratory in Princeton, N.J., and who specializes in atmospheric pollution and related climate effects. Researchers, he says, should focus efforts on how to use technology to reduce the use of biofuels and thus curb pollution over south Asia. A 1999 experimental study showed that particulate pollution, which includes such particles as mineral dust, sulfates, organics and soot, over the Indian Ocean has 10 times as much influence on the heat budget of the atmosphere as greenhouse gases do. And, unlike greenhouse gases, which trap heat radiated from Earth in the atmosphere, such pollution can cause either cooling or warming of the atmosphere, depending on whether the particles reflect radiation, as sulfates do, or absorb radiation, as soot does. Thus, Venkataramans team recommends that any initiatives to slow global warming should consider limiting emissions of black carbon in addition to controlling greenhouse gases. Changing the type of stoves used in Asia could be an important first step, as the team found that black carbon emissions from the fossil-fuel stoves were 3 to 50 times lower than those from biofuel stoves. Cleaner cooking technologies not only could yield significant local health and air quality benefits but also could have an important role in climate change mitigation in the south Asian region, the authors suggest, as well as other parts of the world where cooking with biofuels is prevalent, including South America, Africa and other parts of Asia.